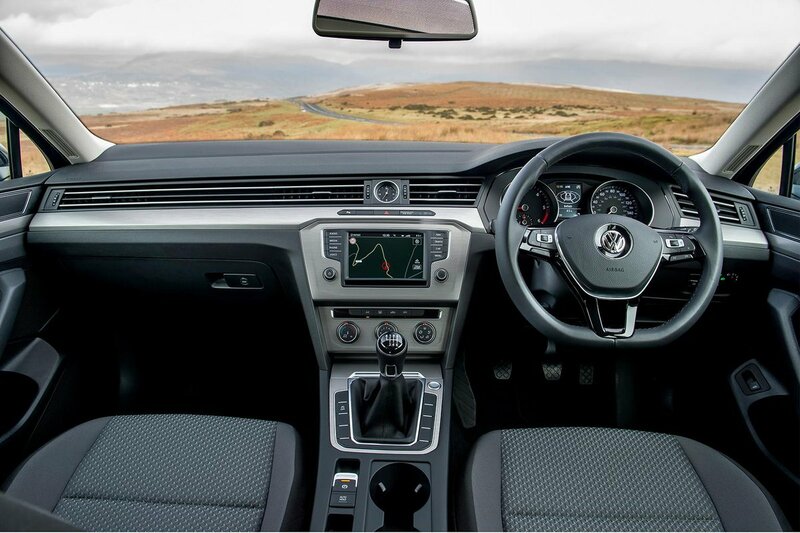 Volkswagen Passat Estate Interior, Sat Nav, Dashboard | What Car? All Passat Estates get adjustable lumbar support and height adjustment on the driver’s seat. 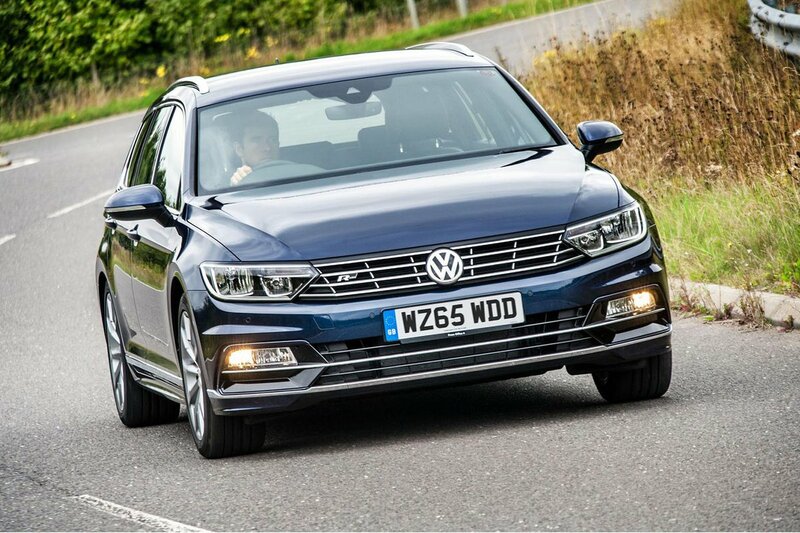 This is a greater breadth of adjustment than you’ll find as standard on many rivals and, combined with good steering wheel reach and height movement, means the Passat Estate is one of the more comfortable cars in its class. The dashboard is also simple to use, with all the often-used knobs and buttons clearly labelled and easy to reach. A useful option is the Active Info Display, comprising a 12.3in screen with configurable digital instruments in place of the standard dials. It lets you show lots more information clearly and just below the eye line. You can also add a head-up display, although this reflects onto a plastic screen and in our experience isn’t very clear. 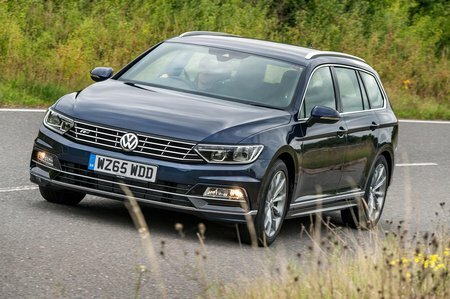 The Passat Estate has excellent visibility that's on a par with the Skoda Superb Estate, thanks to large windows and fairly upright pillars. It’s still a big car, with a sloping bonnet and a long boot, so it can be tricky to judge the car’s extremities in tight spots. That said, all except entry-level S and Bluemotion models get front and rear parking sensors. An automatic parking system (which senses if a space is big enough and steers into it for you) is available as an optional extra, together with rear-view or 360deg camera systems and blindspot warning. All versions come with an 8.0in touchscreen with super-clear graphics and very user-friendly menus. In fact, other than the swish systems in premium rivals such as the BMW 3 Series Touring and Audi A4 Avant, the Passat Estate’s system is about the best there is. Every model includes a DAB radio and Bluetooth. If you move up to SE Business, you get sat-nav along with speed limit display, 3D maps and online features including live traffic, weather and local parking space reports. All models get Apple CarPlay and Android Auto as standard, so you can use your smartphone apps via the touchscreen – including its sat-nav if you have S trim without this built in. The top-spec 9.2in screen upgrade isn’t really worth the extra cost, though; it’s expensive and some of its added features, such as gesture control, don’t work very well. Compared with cheaper rivals such as the Ford Mondeo Estate, the Passat Estate has a really smart-looking interior. There's a good variety of dense-feeling materials, well-damped air-vent sliders and a small analogue clock, all of which makes the interior look upmarket. It definitely feels like an upgrade of the already smart Skoda Superb Estate, our favourite big family estate, but it's still some way behind the excellent quality of an A4 Avant.